Teaching English may not be your best option in Buenos Aires as there is a lot of competition from Argentines who are well educated and have good commands of English and also from native English speakers who are tempted to live the South American adventure and decide to live in Buenos Aires for a while. However, the competition is not so fierce in Rosario. All in all, teaching English at a school or institute doesn’t pay much but if you are looking for a temporary solution (say 2/3 months), it could be a good option especially in Rosario. I have decide to compile a quick list of the some of the English language schools in Rosario, Argentina to help you in your job hunting. Asociacion Rosarina de Intercambio Cultural Argentino Americano. PS: Do a little bit of research on each one of them and then get in touch with them directly to see if they are looking for staff. I cannot make any recommendations as I don’t know any of them personally and don’t know their recruitment process but I thought this list could be handy if you are looking for an English-speaking job in Rosario. Be creative in your approach, they may not need someone to teach but may need help with admin tasks or sales, you never know. PPS: No need to send me your CV or details of your job search; I am not a recruitment agent. Both Toolset and Kids & Fun require their teachers (for their children’s programs) to attend a training in Buenos Aires that is only offered periodically (I think 2x per year) and, as such, they’re only interested in teachers who are here for the long-term. I find that it’s much more difficult to find a job teaching English to children than teaching adults or Business English. Toolset does have a Business English program, as well. Thanks Meag for your tips! Looking forward to seeing you around in Rosario. I would love the opportunity to teach English in the Argentine interior. I did teach English in Asuncion, Paraguay, many years ago, and liked very much that region of the Americas. I am a native English speaker from Florida, USA. Hi Kenneth, Thanks for stopping by and commenting! If you ever decide to work in Rosario, make sure to get in touch and check our website for more information about job opportunities. Thanks for the information. I would like to know more about teaching in Rosario. It really looks like a nice city. My hero Lionel Messi is from there and it would be cool to live and work where he grew up and has always seemed to mention fondly the city. He is definitely their best tourist ambassador. I hope they are all like Leo! Anyways I heard that Argentina doesn’t pay well at all and that they are late paying teachers. I would like to be able to be completely independent and support myself doing this/private tutoring. I had an argentinian professor in college and she said that everything in Argentina is fairly expensive and to do what I want to do I would be a pauper. I don’t want to live in a mansion but a decent apartment, enough money for 3 meals a day that I make, travelling/going out/savings. Let me know what that situation is in Rosario because otherwise I am very interested. Also is it easy to get residency or a work visa as a US citizen? I definitely can’t be flying a few times from there to DC to get papers stamped and would like to have everything taken care of before I set off. Any advice you have I would greatly appreciate it. Finding a job is just the first obstacle! You also need a company that agrees to sponsor you for your work visa… not an easy task but it is possible. However, nothing stops you from visiting Rosario on a tourist visa (valid for 3 months) and see how you like the city (or not), then during your stay get in touch with local companies and get a feel for the current employment situation. The economy is not at its most stable point in history and things can change from one month to the next. True that salaries in Argentina are small and very badly affected by the current inflation (25%). If you are on your own, a salary from teaching English (either privately or for a company (that may or may not declare you)) will hardly pay for your rent and food for the month (nothing for travelling or savings so come prepared). Most of the foreigners here in Rosario are in a couple with an Argentine resident (that’s why they came here in the first place) so they split cost and can live with a small salary to start with. Flatshare are not so common but there are ways to find flatmates especially as there are loads of university students in town. I don’t want to discourage you…but be prepared. I want to take conversation classes with an american, having lived in the states for many many years I speak quite well and want to mantain my fluency. 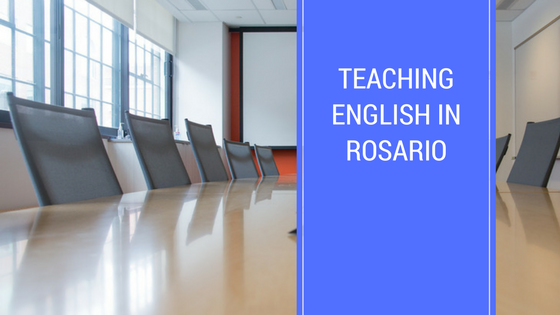 I am currently living near Rosario and while I dont have any formal teaching experiance, I have loads of customer service experiance, and at the very least would be a GREAT conversational parter for ESL students. I have worked for the University of California and within, closly with the Extension center which has the primary function of higher education for international students. Please feel free to contact me with any leads or questions. Thanks for getting in touch. You didn’t leave your email address so it will be hard for me to give you more information but I wish you the best in your search. I have an interest in working in Rosario. I have 2 1/2 years of customer service experience with insurance companies and I was also thinking of the idea of teaching English to business people. Do you know of any companies that hire english speakers? I have an upper immediate handle in the Spanish language, is it possible to work for someone with that? I am really not sure where to even start. Thanks! Hi Adam, have a look at my lengthy reply to Ryan (above) and it will give you an idea. Just to give you a couple of starter point, I would recommend you to check the following sites: LinkedIn, zonajobs.com.ar, computrabajo.com.ar and bumeran.com.ar. If you want to teach, send a CV to all the school mentioned above. Check out on LinkedIn for the largest companies in Rosario and send a CV or better go to their offices and ask to speak to someone in the HR department. In Argentina, to be able to find a good job, your past experience and qualifications are important but above all it is your connections that matter. So if you speak Spanish, go to conferences and professional events in Rosario and network, network, network! i would like to take some private English lessons in rosario to prepare myself for the TOEFL-test, can you recommend me someone? thanks! Thanks for getting in touch! I can certainly recommend you a great English teacher in Rosario (native speaker) to help you prepare your exam. I have just sent you an email will her contact details! Best of luck with your test! also, another quick question. Do the English teaching jobs require one to travel a lot or do the courses mainly take place at the institute? Hi Adam, this will depend on the institute. I know that some schools do in-company teaching in Rosario. Get in touch with them directly. Best of luck. I am planning on moving to Rosairio soon and would love to teach English there.I have lots of work experiences.I used to teach grammar and vocabulary.Would love to continue on doing that.